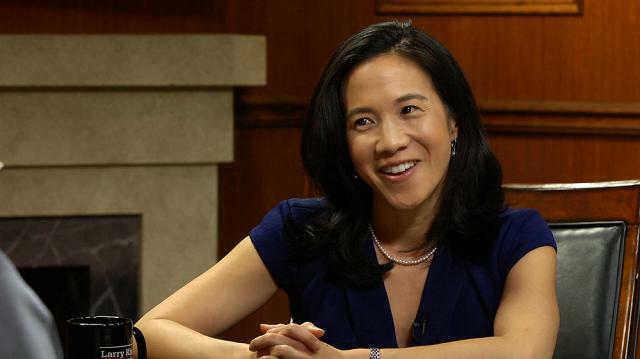 Angela Duckworth, author of ‘Grit: The Power of Passion and Perseverance,’ breaks down the four elements of the trait – interest, practice, purpose, and hope – and explains why she thinks we can all learn to be grittier. Who’s grittier: Men or women? Larry King: There are four traits that gritty people have. Interest, practice, purpose and hope. Let's break them down, interest. relatively speaking a weakness for you with full concentration and feedback and then making these little micro refinements to do your work a little better. Larry King: Purpose. Angela Duckworth: Purpose I use to mean having an other centered motivation. In other words, feeling like, for example having a television show would influence other people's well-being than your own, something that serves others. you can do to make them better . Larry King: You'vewritten a book about it, therefore you think it can be taught. Angela Duckworth: I have written a book about it, and I do believe it can be taught. That's right. Larry King: And you can learn it at any age? Angela Duckworth: I think so, yeah. I think human beings are wired to learn at any age.